And so, on Christmas Eve eve, we come to the last post in this 12 Blogging Days of Christmas series. I really hope you've enjoyed it, and that it's introduced you to some new talent. 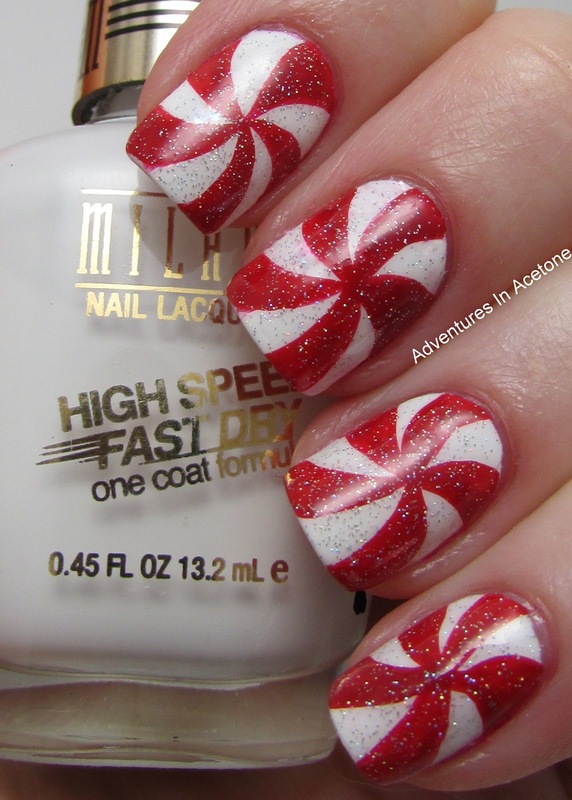 We finish with Jacki from Adventures In Acetone, who did one of my favourite manis of this year - HERE. Lately, as a mother of 2, she's been doing a lot of swatching, so I'm really glad she got her art hat back on for this. Now she just needs to show me how to do it !! I painted 2 coats of Milani White On The Spot and then went in with my striper art brush and Milani Rapid Cherry for the red details. I topped it with one coat of China Glaze Fairy Dust for some sparkle of the season and one coat of Poshe top coat. I hope you like it!